Are you looking to buy the best waffle makers available in the market? Who doesn’t love a delicious easy to make breakfast right? Waffles are the first thing that comes in our mind when we think of making something sweet in breakfast. Not only are they delicious but you can top them using your favorite ingredients. 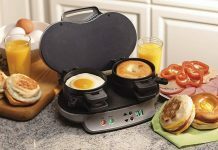 Before moving on to the waffle maker review, if you are someone who doesn’t miss the breakfast, then you might like to read our review about the best breakfast sandwich makers. It can be ice cream, fresh fruits, maple syrup or honey. No doubt why kids love waffles more than any other thing to have in the morning. And making them is no big deal if you have the best waffle maker. And to ease your search of getting one, we are here with best waffle maker reviews of 2019. However, having a waffle daily for breakfast is not a healthy option as it contains a high amount of sodium. Besides sodium, they use all-purpose flour and sometimes yeast in the batter. So it is good to have them occasionally rather eating daily. No matter if you are going to use waffle recipes once in a week or a month, perfectness and taste matters. So to have a cafe like taste and crisp we present you our best waffle maker reviews. 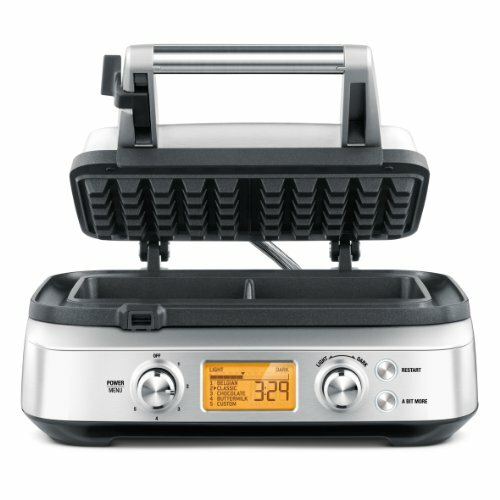 Below reviews contain both classic and Belgian waffle maker units so that you can get exactly what you’re looking for. You can save time by making 2 waffles at once with cuisinart double Belgian waffle maker. The 1-inch deep pockets of the machine bake your batter professionally. In fact, cuisnart waf-f20 provides a 6-setting browning control knob to get restaurant-like crisp at home. This browning option is applicable to both the plates. Also, have the option to cook batter from light and fluffy to crisp and brown. So no more waiting in long queues for your favorite dessert with cuisinart Belgian waffle maker. Led lights and audio beep tones indicate when the unit is ready to cook and when waffles are done. In fact, there are 2 different light indicators that illuminate when each of the plates is ready. Furthermore, non-stick coating on cooking surfaces quickly release food as well as is easy to clean. Plus it comprises of easy-to-handle rotatory feature for even baking on top and bottom side. Thus, all of its features simply makes it the best belgian waffle maker for the money. 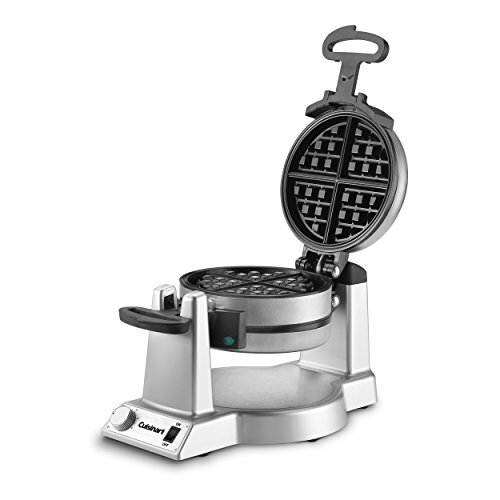 If Belgian waffle is not your choice then you might love this all clad waffle maker having a classic round design. This round design bakes batter measuring 6.5 inches in diameter by 1/2-inch thick with 4 sections. These sections are very easy to separate by hands or with the help of the knife. 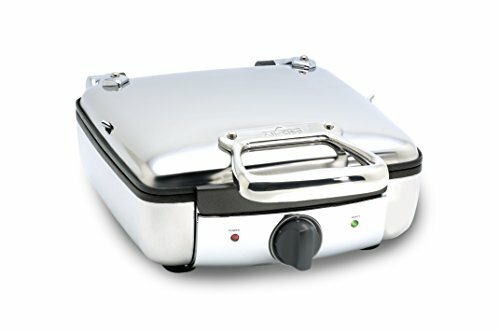 All clad wd700162 classic waffle maker offers 7 browning levels. With these much of levels, it becomes easy for you to decide what type of bake you want. 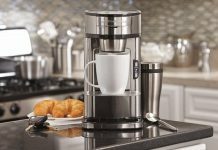 From light fluff to brown crisp, this unit will give you exact cafe-like dessert taste. Advanced heating technology along with a steam-release system provides better baking of batter. As a result, it makes crispy on the outside and fluffy on the inside waffle. Whereas the non-stick coating ensures the food comes off quickly without sticking on plates. Apart from that, there is a light indicator to guide you when to pour the batter and when it is ready. And let us not forget about its highly polished stainless steel body that will make your unit look new for years. Baking becomes lot more fun if the machine automatically sets the cooking time. And with the same functionality, we have a Breville waffle maker on our review list. Its intelligent system automatically adjusts cooking time according to the style you select. 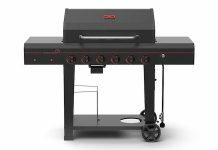 In total, it offers 4 in-built styles and one custom settings. These 4 options include Belgian, classic, chocolate and buttermilk baking style. Whereas, custom options is to bake waffle recipes other than the in-built one. Just turn the knob and select mode of baking from 12 different browning option. An LCD display informs you about all ongoing functions. In case you wish to crisp your food a little bit more after baking, Breville provides a bit more function. This feature lets you add a bit more brown without having to restart. As a result, it saves your time of setting the device all over again as well as gives perfect crispiness. So conclusively, it is the best waffle maker that with a bunch of features that makes you waffle just like restaurants. Flipping in-between process of making waffles makes them thick and fluffy. And if you love such type of thickness, we have a perfect product for you. 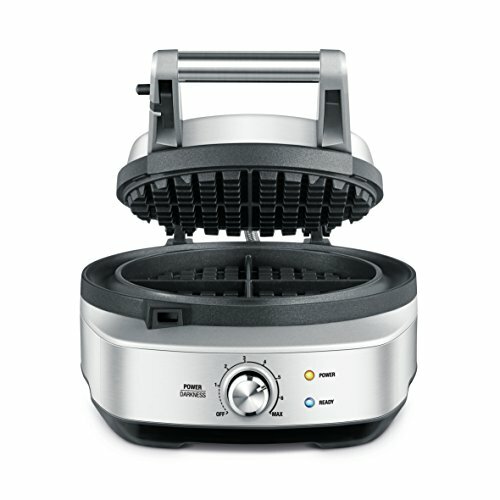 This Hamilton beach waffle maker comprises of a flip handle. With a gentle turn of the wrist, Hamilton beach lets you effortlessly bake thick, golden brown waffles just like restaurants. Moreover, it comprises of a drip tray that catches any batter overflow. As a result, reduces mess on your countertop. In order to wash the drip tray simply remove it from the unit and place it in the top rack of your dishwasher. 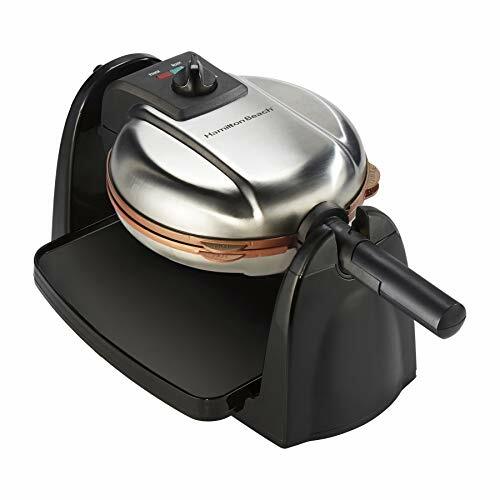 Similar to many other units, Hamilton beach belgian waffle maker also includes indicator lights. However, as the price of the product is less, it provides you with only 3 browning-setting. But this much browning control is good enough to make your food the way you like. Its cool-touch handle is safe to touch after baking process is complete. You will not need oven mitt in order to flip or open the unit. Thus, less cost and great features make it one of the best cheap waffle maker in our review list. Wide wrap-around moat catches and cooks overflow. Non-Stick Surface: Premium PFOA-free nonstick prevents waffles from sticking. If you hate dealing with digital display and prefer manual setting, then here’s a perfect unit for you. The Breville classic waffle maker bwm520xl with manual settings is simple to use. Just like every model on the review list, it too comprises of indicator lights. These lights let us know when the power is on and when you can begin baking. Other than that, the die-cast plates allow heat to transfer freely. As a result, provides even cooking as well as avoid batter from sticking to surface. Adjustable control dial allows selecting perfect heat setting for your food. Whereas, a no-mess moat collects extra batter that comes out while you close the lid. This way your countertop remains clean as well as cleaning afterward becomes very easy. Unlike other waffle makers, this beeps only when the baking process is over, this product beeps twice. Once when it reaches preheating temperature and second time when your food is ready. This user-friendly feature makes it stand as a best classic waffle maker. To solve the problem of overfilling here comes cuisinart vertical waffle maker. Yes, it is vertical in shape. Beginners often have no idea how much batter should they put inside the plates which leads to spilling. But not to worry as Cuisinart waf-v100 is the ultimate solution for them. All you need to do is just take a scoop of batter and pour it through the wide opening at the top of the vertical unit. You even get a batter pout spout to fill in the exact amount of batter. Just like other horizontal units, this Cuisinart vertical waffle maker also has indicator lights and an audible alert. While lights indicate about power on and preheat status, beep sound lets you when the baking is over. In addition, 5 browning levels allow you to choose if you want your food to be soft or crispy. A cool-to-touch locking handle is easy to open and close. It also prevents the batter from leaking out of the unit. So overall, cuisinart vertical waffle maker is both easy to use and budget friendly. Enjoy thick deep Belgian bites with Breville belgian waffle maker. This 2-slice iron has a sturdy stainless steel finish with cast aluminum cooking plates. So no need to worry about product durability as it is meant to last for years. 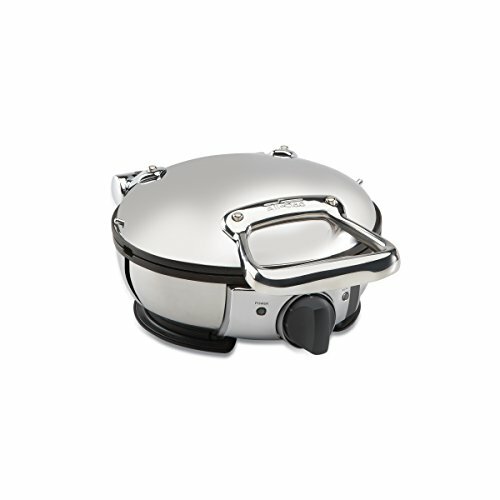 The Breville waffle iron is very simple to use and has 5 browning levels. It consists of 2 knobs, one for power and the other one is for adjusting browning type. All you need to do is, pour your batter into Belgian waffle maker, adjust the knobs and wait for hot dessert. The moat will catch any overflow and will save your countertop from being messy. A lower heating element under the moat helps in light baking of the batter present in inside it. So this way you have very little mess to clean. However, the cost of this product is bit higher as it is a double belgian waffle maker. Otherwise, it is easy to use and durable unit that will keep filling your appetite for years. Cleaning deep belgian pockets after use is a bit of time-consuming task. Also, these plates are non-removable so you have to compulsorily clean them with a cloth or tissue. But things become a lot easier if the plates are removable. 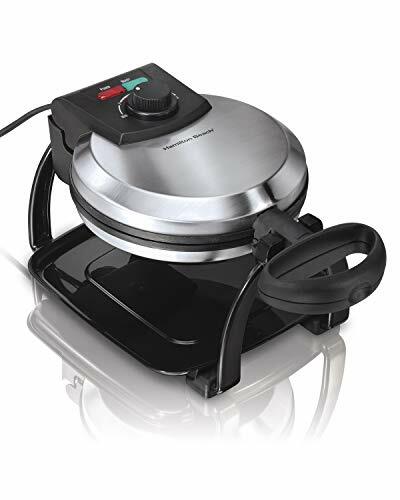 Hamilton beach waffle maker comes with removable plates that make cleaning of iron a breeze. Simply take off the grids from the unit once the unit gets cool. Then after, you can wash them manually under tap water or place it in a dishwasher. 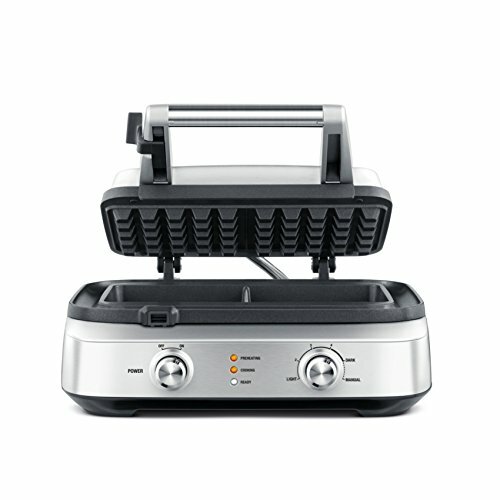 Flipping action of Hamilton beach Belgian waffle maker 26031 helps in making thick and fluffy waffles. Furthermore, a drip tray is responsible to collect extra batter falling off from the grids. This tray is easily removable as well as dishwasher safe for simple cleanup. Besides that, it comprises light indicators on both the sides that let you know when your food is ready. Simple user-controls and deep pockets of plates make it is best flip belgian waffle maker. 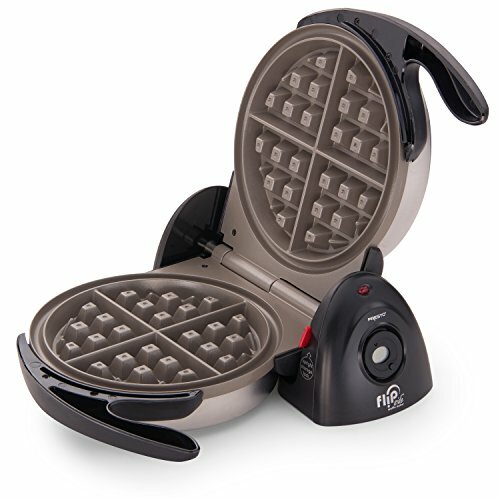 The professional style rotating waffle maker from presto is for people who are under tight budget. In spite of having such less price, it comprises of an extra-thick grid. This thick grid bakes a 7-inch diameter belgian waffle with four easy-to-cut sections. While the deep pockets make sure to hold more syrup and fruits on top. Speaking of the interior, the non-stick coating easily wipes clean. So you do not have to waste much time cleaning after you having your favorite dessert. A countdown timer with digital display signal when the time is complete. Just pour the scoop of batter inside the machine, close the lid and set the timer. Furthermore, dual function base assures convenient rotation for baking. Also, it easily locks in upright position in case you lack storage space. Let us not forget about its stainless steel exterior that is both durable and easy to clean. Thus, it is one of the best rotating waffle makers in terms of money and functions. Want to cook more batter in less time? Then here comes all clad belgian waffle maker with the large cooking surface. Therefore, you can make 4 square waffles at once. All of them have easy-to-cut sections and extra-deep pockets so that you can fill more butter, syrup or other toppings of your choice. Advanced heating technology helps in even browning of the batter. Whereas, a steam-release system bakes the batter crispy on the outside and keeps soft on the inside. Hence, with all clad waffle maker you will have your dessert just like you have one in the restaurants. Ready to cook and ready to eat LED light indicators are for ease of use. 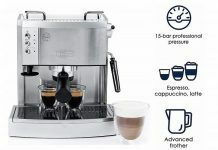 Speaking about its construction, the highly polished stainless steel body and riveted stainless steel handles are very durable. In fact, you just need to wipe the outer surface to make it look shiny new. Moreover, the all clad Belgian waffle maker has a locking latch which makes it possible to store the unit vertically. This will help you save lots of storage space. If the digital system of waffle irons bother you then here comes an easy-to-use waffle maker. The Cuisinart belgian waffle maker waf-300 with deep pockets bakes batter like a pro. It comprises of a temperature control knob and 2 simple light indicators. In addition to that, the audible alert sound makes you aware of when your food is ready. The large cooking surface that can make 4-slice of Belgian waffles at one time. 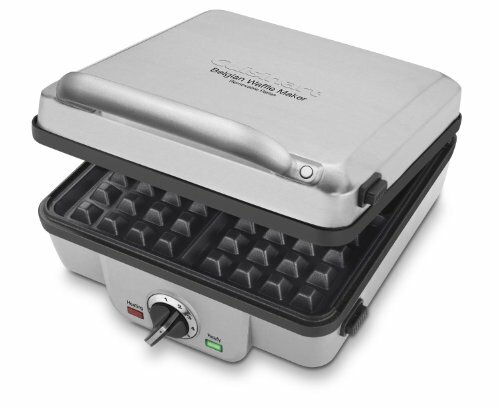 Thus, it is the best belgian waffle maker for home use if you love to throw dessert parties. 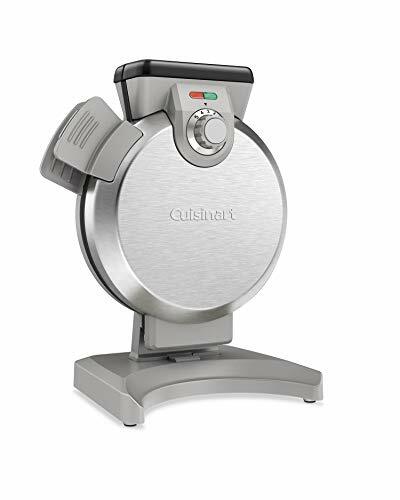 Cuisinart waffle maker waf-300 also includes 4-slot pancake plate. You can even cook eggs on pancake plates. Also, these plates are completely removable as well as dishwasher safe. And due to this reason, it stands as best waffle maker with removable plates. Apart from that, the product comes along with tongs and recipe book. While the non-stick tong helps to remove waffles safely from the surface, the book includes various types of waffle recipes. Last on our best waffle maker review list we have the perfect product for families with kids. This 4-slice unit can make 4 pieces of Belgian waffle with extra-deep pockets. These deep pockets hold more syrup and butter so that you can fully enjoy your meal. 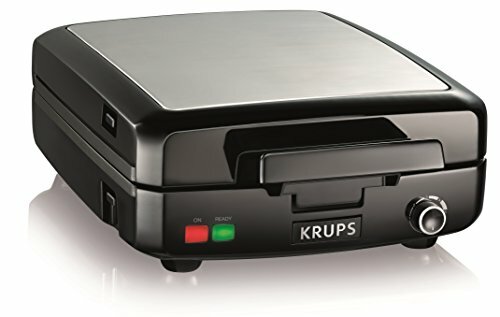 Krups waffle maker die-cast plates are completely removable for easy cleaning. And non-stick coating on them prevents food from sticking. Similar to the majority of the models, these plates are safe to place inside a dishwasher. Krups waffle maker comprises of a cord wrap and handle lock that helps to store the unit conveniently. Other than that, it also has a red and green light indicator to keep you aware of different functions. While an audible beep lets you know when the machine is on, ready to bake and your Belgian waffles are ready. So one thing about this Belgian waffle maker is, you do not have to open the unit in between baking just to check the status of batter. It reduces your effort and saves time. You can use a plate of salad with your waffles to make it a healthy breakfast. 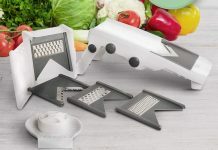 Use a mandoline slicer to make salads. 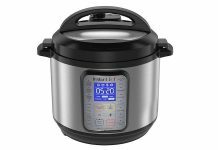 Check out more kitchen appliance reviews here. Ceramic waffle maker: Ceramic material is free from harmful chemicals. Also, it is non-stick so your food won’t stick to cooking surfaces. And the cost of ceramic waffle maker is not too high to move your tight budget. Cast iron waffle maker: Durability of cast iron is hard to beat as it is so strong that it can last for a lifetime. But however, they are expensive as well as needs higher maintenance than ceramic ones. Several numbers of browning levels mean more control over the type of waffle you want. But the cost of the product will increase with high browning level. Whereas, a cheap waffle maker will have less number of browning level. A first and important step before beginning to clean a waffle maker is to let it cool down. Turn the machine off after making the last batch and keep it open. Once the cooking surface is cool to touch, then you can begin your cleaning process. If removable parts of your unit are safe to place inside the dishwasher then you just need to quickly rinse them before placing them inside a dishwasher. Look at the manual properly and then place the parts accordingly onto the top rack or bottom rack of the dishwasher. Let the plates and other parts to dry completely before using or storing them. Remove excessive oil on the cooking surface by wiping them with a paper towel. In case you don’t have paper towels, use a damp cloth instead. Now fill the cooking grids with a little bit of warm water and let it sit for 5 minutes. Doing this will loosen up dried batter stuck on cooking plates. Make use of a sponge to remove water and crumbs from the unit. Then again make use of paper towels to wipe the entire interior of the unit. Let your waffle maker remain open for a while to let it dry. If possible, keep it under the fan for 5-10 minutes. The main difference between a regular waffle and belgian waffle is of their pocket size(1, 2). A belgian waffle will have deeper pockets than a regular one. And deep pockets will store more syrup or butter. Whereas, a regular classic waffle will have a shallow pocket that will hold less syrup or other toppings. Be it Belgian or classic, one sure thing is we want a unit that cooks batter evenly and gives perfect browning to it. So our best waffle maker reviews contain both the styles of makers so that you can get your perfect unit.